Author's Notes: Outside of a few drabbles, I have never written an extended comicverse only story. Yet, I was so overwhelmed by The Wild Hunt that I ended up reading it five times. This story is based on the trade paperback version, which I believe is missing certain interpolated extra comics that were included in the separate issues. I can't help noticing that most of the recent Hellboy comics will insert some mention of Trevor Bruttenholm or narrate some memory that Hellboy has of him. 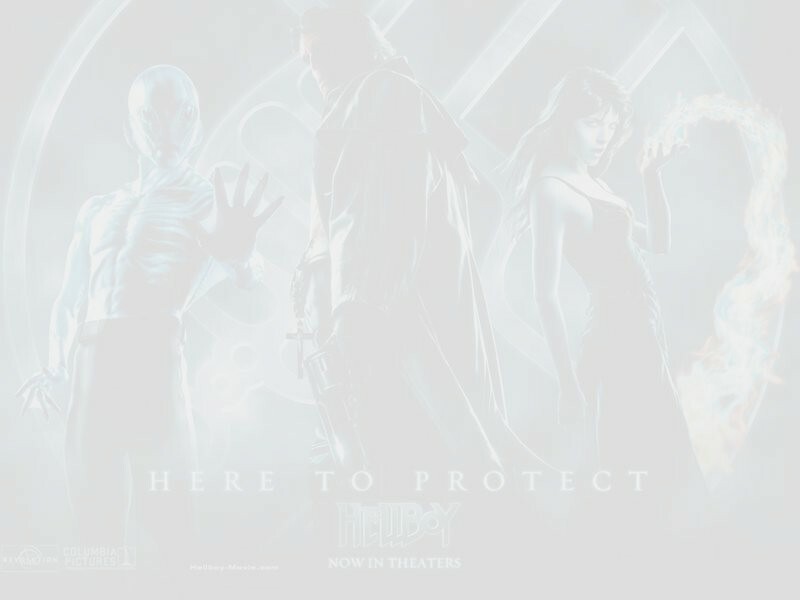 In many of these same recent issues, Hellboy has also been interacting with the ghosts of people that he used to know. I can't help thinking that at some point the ghost of Trevor Bruttenholm will make an appearance. This is my own version of such a meeting. Mild spoilers if you haven't read The Wild Hunt. After the darkness and struggle of much that had happened earlier, Hellboy reveled in the calm to be found in the bright day and rolling green fields of the Irish countryside. He watched as the young woman who had been at his side skipped ahead, a light breeze blowing her long red hair and wrapping her coat and skirts around her ankles. Every so often, as Hellboy meandered along, he gave another experimental swing of the long golden sword he now grasped in his left hand. He couldn't help recalling those times in his youth when he used to play around with the dusty ancient weapons that were always to be found in Trevor Bruttenholm's Brooklyn residence. Somehow, that distant memory of carefree days helped drive away the more recent memories of blood, pain, and guilt. Still, a remembered voice kept whispering in the back of his head, "The ruin of things will come from your good works. You are your father's son." "Nope. Ain't gonna go there," Hellboy muttered under his breath and he looked again at the woman, who was now stooping to collect a bouquet of meadow flowers. Now, she was one of his 'good works', one of the best, in fact. He had been fourteen at the time he rescued baby Alice from the clutches of the 'wee folk', large enough physically to fight the dark forces which threatened humanity, but still young enough to believe that his 'good works' were actually making a difference for the better. "I'm pleased to see how well you turned out, my boy." Hellboy turned in surprise toward the unexpected and, yet, way too familiar voice. The man who was standing there, dressed in a brown tweed suit with matching vest and bowtie, looked very much like the young Trevor Bruttenholm that Hellboy had recently seen in a 1943 painting. Yet, certain lines in his face and the sprinkling of gray in his reddish-brown hair and beard reminded Hellboy more of the mentor and father-figure of his teenaged years. "I'm glad you think so, sir. Me, I'm not so sure I turned out all that great." The day, which had seemed so peaceful before, now seemed filled with dark voices that spoke of doom and destruction. "I've always known you were destined for great things," Bruttenholm said with a gesture at the sword that now seemed so heavy in Hellboy's hand. "Destiny isn't all that it's cracked up to be, Professor. I feel like I'm being forced down a road I'd really rather not take." Hellboy turned away and began to walk faster in order to catch up with Alice. He felt an achingly familiar hand on his shoulder. "There are often times we must tread a path not of our own choosing, my boy. Yet, we still can choose the manner in which we go forth." "What if I can't? No matter how hard I try to do the right thing, it all just blows up in my face." The still gentle hand on his shoulder grasped him even more firmly, pulling him around to face Bruttenholm again. It had always impressed him how a man who had been, for a significant portion of his life, so much smaller than he was could still compel him to do something he would rather not do. "There is no guarantee that trying to do the right thing will turn out the way we would like. If there were such a guarantee, I would probably not have made half of the mistakes that I did in raising you. All we can do is try our best and hope that things turn out right in the end." Hellboy looked into the face of the man who had raised him, the man he had last seen dead on the floor of his Brooklyn residence. "No matter what mistakes you might have made, it was you who always kept things together for me. Things were never the same after you were killed, sir." "Of course not, my boy. When a son loses his father, he must try to learn to make his own choices, forge his own way in life, and deal with his own mistakes. It's not an easy task for any son. Did you think it would be easier for you?" Hellboy sighed. "I've been hearing way too much crap recently about my 'father'. You don't know how much I wish you really were my father, but you aren't." "I'm the one who raised you. That must count for something in the grand scheme of things." Unexpectedly, Hellboy found himself smiling. "It always counted with me, sir, even if you did make a few mistakes here and there." Bruttenholm smiled back. "Well, there you go. It's nice for all my hard work to be appreciated." Hellboy looked around the meadow, which once again seemed warm and serene, to find that Alice had moved even further away from him. Turning back to Bruttenholm, he asked the question he had always wanted to ask. "Did you ever wonder if raising me was the right thing to do?" Bruttenholm placed one hand on Hellboy's enormous stone right hand. "I may have had some doubts and concerns about you, my boy, but raising you was never one of them. I never doubted that I was doing the right thing and I always trusted you to act as I had raised you." Hellboy nodded. "You always did trust me. I just wish I could trust myself as much. All I seem to have is doubts." "My boy, the only thing you can do is to make each choice as it is presented to you and do what you believe is the right thing." Hellboy held out the sword, noting how it sparkled and glinted in the bright sun. "What if I make a mistake or do the wrong thing for the right reasons or the right thing for the wrong reasons?" "You will do what you must. I have absolute trust that in the end you will do what needs to be done." Hellboy lowered the sword again, closed his eyes, and remained silent for a very long time. "What if that trust is misplaced?" he finally said in a very small voice. "Trust, my boy, is never misplaced. It may be disappointed, but it is never misplaced." Hellboy opened his eyes, to find that he was sitting alone on a green hill, the sword lying on the grass in front of him. Picking it up once again, he hurried to catch up with Alice. Author's Afterword: All feedback is welcome. I hope I managed to capture the subtle differences that are to be found in the comicverse as opposed to movieverse versions of Hellboy and Trevor Bruttenholm.